Generate Opt-In, Permission based email ids for higher ROI ! Email append is a data quality service designed to improve the quality of your existing database and hence to accelerate and enhance your email marketing campaign. 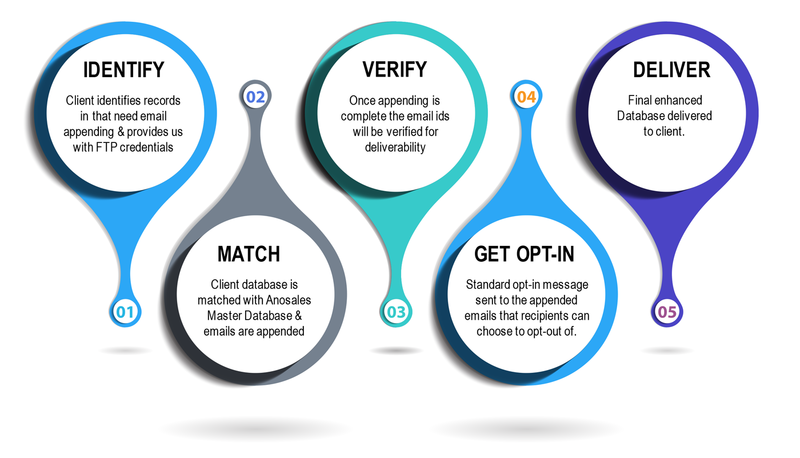 Email Appending is a process through which we match the names and physical location of customers or prospective in the existing database with their accurate and deliverable email id. Through this service, we provide 100% opted in email addresses to your existing contact database. The Addresses will be highly accurate and deliverable. With our email appending service we can help you add email address, title, telephone and fax numbers, etc to your business account profiles.